FileTrain has all the basic functions for moving and copying files and folders, over network or via FTP. Several functions can be added to the transportation of the files, like filtering which files are to be copied / moved, and routing to various destinations based on a number of conditions. File Train also has some simple image processing functions, like entering metadata and scaling. 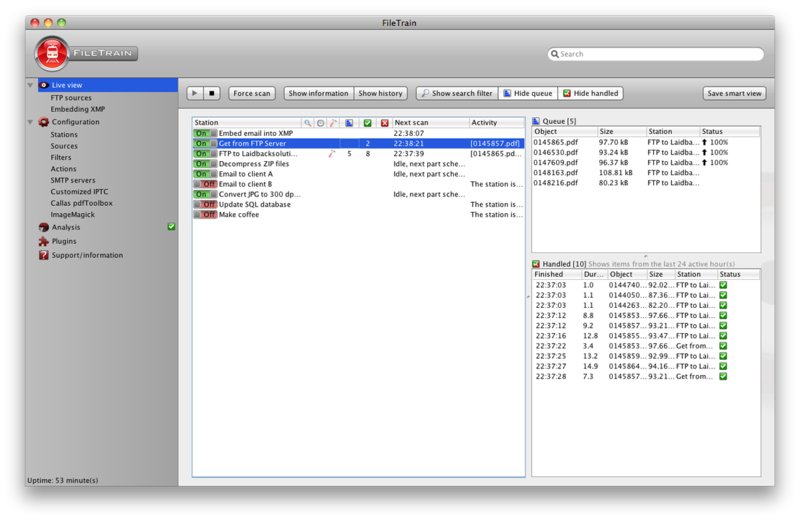 FileTrain has several email functions integrated. Files can be sent via email and you can set up functions in FileTrain for collecting email from defined accounts, with unwrapping of attachments. These attachments can then be routed further in other channels by FileTrain. FileTrain has an own function for back up, which makes it possible to make a copy of all the files passing through the defined channels. FileTrain has a log of all activity in the software, with the possibility of sending a warning by email if an error should occur in the file flow. FileTrain has no limitation on the number of folders which can be monitored or on the number of distribution channels. In addition every channel can be set up to conduct several functions in order. To exemplify, one source file can be sent to a number of destinations via network, FTS and/or email. FileTrain can be installed both on Windows server and on work stations, and can run as application or service. In addition the software can be installed as an application on Macintosh work stations.